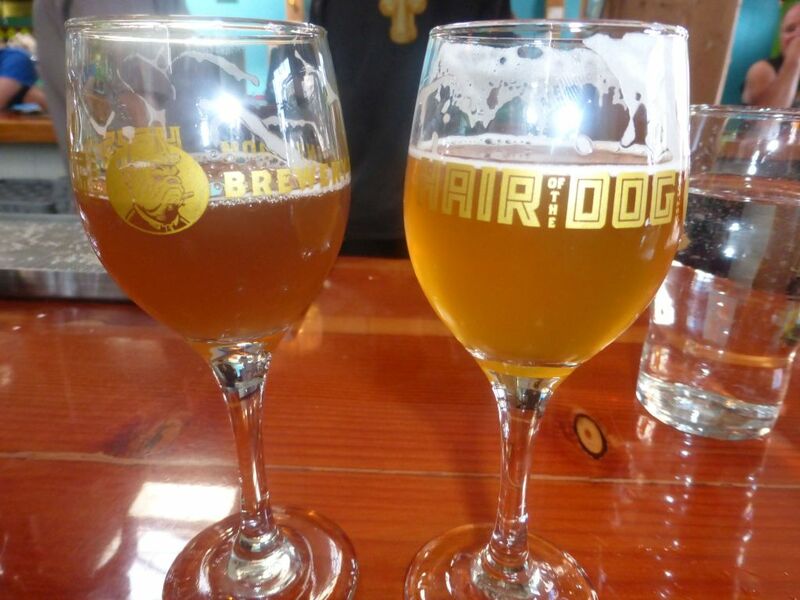 One of the more interesting breweries I visited in Portland was a smaller brewery called Hair of the Dog. I only tried three different beers there but I had some very impressive brews. While there I tried tasters of the Blue Dot Double IPA, Beer Week Strong Pale Lager, Adam Stout, and Bourbon Barrel Aged Beer Week. I only got a small taste of the Adam but it was enough for me to review it. Blue Dot Double IPA was a delicious slightly sweet beer that focused on the citrus and tropical fruit with a little bit of a soapy flavor in there. At 7% it doesn’t really fit what I consider a double IPA but it had a lot of good flavors. Second on the list was the Beer Week Strong Pale Lager. The higher alcohol content was certainly noticeable but I really liked the way it mixed the pilsner flavor with the citrus hops. It also wasn’t as bitter as the Blue Dot while still presenting plenty of hop flavors. Blue Dot Double (left), Beer Week Strong Pale Lager (right). The Adam is very close to a stout so I will refer to it as such though the brewers don’t want to label it a stout. The flavors tended towards the plum malts with a little bit of chocolate. Though I could taste some chocolate flavors, I found that they were overpowered by the malts a little too much for me. Finally, the bourbon barrel aged beer week was a great introduction to how a hoppy beer responds to bourbon barrel aging. Because it wasn’t particularly malt-forward to begin with it had plenty of room to highlight the flavor of the bourbon. This is one of those beers best saved for those who appreciate a good bourbon. Some might say that the brewers went a bit too overboard with the barrel aging, but I think it was just right. With plenty of bold flavors from intense amounts of hops, I was quite impressed overall by the beers offered by Hair of the Dog. I also really liked the Brussels Sprouts they had as an appetizer. It was reasonably priced and yet perfectly cooked and delicious. It was just the right size for a good snack to go with the beers.